President Barack Obama signaled if he wins a second term he would appoint a Secretary of Business. I hope the President asked Romney to be 'secretary of business' , surrender just means you are moving over to the winning side , very honorable ! Of course President Obama wants to meet with Romney, almost 50% of Americans voted for Romney. It is a divided nation and Pres. Obama wants a united nation. I think it's great that he gets to "visit" the WH and see what might have been. It will make him even more jealous. heh. So much for "obama hasn't compromised". All you that posed that must be feeling pretty foolish about now, eh? Obama will eat 47% of the lunch and give the other 53% as "gift" to Rmoney! It's time to hand Mitt Robme to the FEDS!! !....and for him cough up all those UNPAID TAXES and jump-frog him out to the White House lawn to apologise to the American people for his insulting 47% comment!!! Maybe he is just visiting the WH to collect his Obama's GIFT, so next go round he can VOTE for President Obama! Oops, the president already won re-election. LMAO!!!!!!!!!!!!!!!! BYE BYE WILLARD....dont let the WH door hit you in your caymen-island behind!! !.....tell Queen Ann, you were such a sore loser like your dad, and you shoulda taken your father's advice to release ALL YOUR TAX RETURNS!!!! I think Obama should offer Romney a cabinet post… “Economic Advisor” or something like that. Make peace. Also, out Romney’s alleged business-turnaround skills to use. "Hey Mitt. Have a seat in my Oval Office chair. You wish it was yours..."
It'll give Mitt an opportunity to steal some White House towels and an ashtray, cause he'll never see them again. Perhaps they'll discuss how to keep the Star Wars movie rights safe from the Chinese. Why are the president's private lunch plans news? Really CNN, is it that slow of a news day? Indeed. However, this is what adults do...they put aside their differences and sit down at the table (luckily, we don't have to be adults on this site hehe). Mittens is ostensibly one of the leaders of the GOP/Teatroll cabal, despite their sudden about-face rejection of Mittens and the platform they cheered him for running on, so this is a genuine attempt to make a conciliatory gesture on Obama's part. McConnell and Boehner, and probably Mittens too, will respond to it after it happens by continuing to vomit talking opints about Obama not being willing to compromise. Sniffit, it may be soe kind of Jedi mind trick. Lyin Ryan is still chairman of the House Budget Committee. Maybe Willard can use his influence on him to get some kind of compromise. Just a theory. 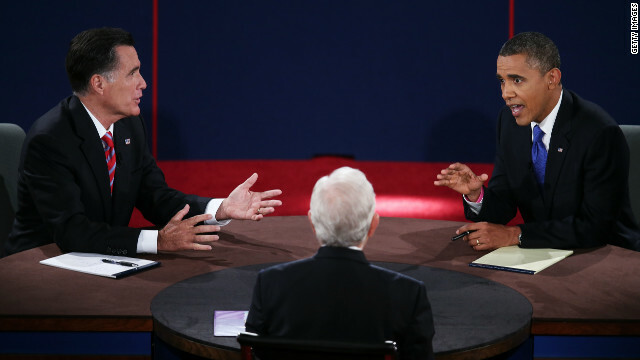 Obama should just have an empty chair there as well, and say "I asked Clint Eastwood to join us....". Perhaps, like with Lincoln, Obama may offer Romney a cabinet position. Lincoln gave cabinet positions to his rivals to help pull the country out of the crisis of slavery and the session of the slavery states from the Union. Obama has praised Lincoln for his acceptance of the competence of his rivals. William H. Seward turned from a rival to a Champion of Lincoln. ha... Obama needs help obviously. He knows Mitt well enough after sizing him up for the election. Why else would he invite Mitt when Obama has done such a great job of blowing off heads of state? It is Mitt that is humble enough to accept... He needs not the money and we know that he thinks Obama is a joke. Obama is so in over his head by now. I worked for the Obama campaign because I thought Romney would have been a terrible president. I still think he has a lot to offer the country, but in a role much smaller than the one he had in mind. Get your head back in the game, Mitt! Politics isn't everything! This is really good to see. Not to often you get "good" political news. I expected this because I believed that Romney still can put up ideas on the Table to help this economy. BTW, Mitt Robme_DRAFT_DODGING, TAX_EVADING_Merchandise Discounted AT 47%, what unpaid taxes? Romney never did anything that violated our tax code. So what are you talking about? Or do you think just because he is smart and makes money he should be paying more taxes? You sound like a true Obamamaniac. I admire our President for the gallant gesture. They should meet off site, Mr Romney does not belong in the White House. After all, it is the peoples house and he hates most of us.